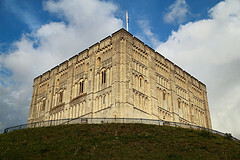 Built after the Norman Conquest as a fortification for William the Conqueror, Norwich Castle is one of Norfolk’s 12 Heritage Sites; and the Museum contains important archaeological and historical artefacts. A Scheduled Ancient Monument and Grade I listed building, the Castle is a real sight to behold. The keep stands at 70 feet high and cuts an impressive figure in itself. It isn’t just the exterior of the castle that has earned it such a phenomenal reputation, however. The interior is equally as breathtaking and there is a huge amount on offer for children and adults alike. Why not take a tour of the Dungeons? This will give you the chance to visit parts of the castle not open to the general public. You can see the instruments used to torture prisoners and the dingy cells they were kept in. If you’re feeling brave you can have a look at the Victorian death heads, which are plaster-casts of the actual heads of locally hanged criminals. For those of you who aren’t into blood and gore, there is plenty more in the way of history. From the Twining Teapot Gallery to the Boudica Gallery, you can immerse yourself in whatever period of history you’d like. Particularly popular is the Egyptian Gallery, containing hundreds of artefacts from Egyptian tombs and collected by wealthy travellers. With some pieces dating back 4,500 years, this exhibition is a marvel of Egyptian wonder and a great place for the kids to learn more about the past. Before you leave, make sure you see the Art Galleries. Consisting of five separate exhibitions, there is something to please visitors of all ages, tastes and interests. So whatever you hope to get from a day out, Norwich Castle has it all – from history to art and architecture. There is a reason why it has such a fantastic reputation and its popularity with visitors speaks volumes. Peak Season (27 June – 2 October) Mon – Sat: 10am – 5pm, Sun: 1 – 5pm.